Pottery produced in Arab-Islamic lands displays in the great majority of cases beautifully inscribed epigraphic bands. The beauty of the inscriptions on pottery is due to the way the text was arranged on the surface and also the way it was designed to produce, in some cases, a sort of rhythm. Kufic is maybe the most handy script to achieve such a rhythm with the perpendicular horizontal and vertical lines composing the words. Even if scholars have concentrated on historical texts (as usual…), it is nice important to notice that other kind of texts were used. What I prefer is when the potter inscribed moralising sentences, aphorisms and proverbs. The bowl’s (MET acc. num. 40.170.25) inscription is arranged and delivered in a way to emphasise the decorative dimension if the epigraphy. Even though there is only a single phrase inscribed, the potter decided to divide it into four parts, setting them around a centre underlined through a simple decoration. Much more can and should be said on the bowl, but not now. 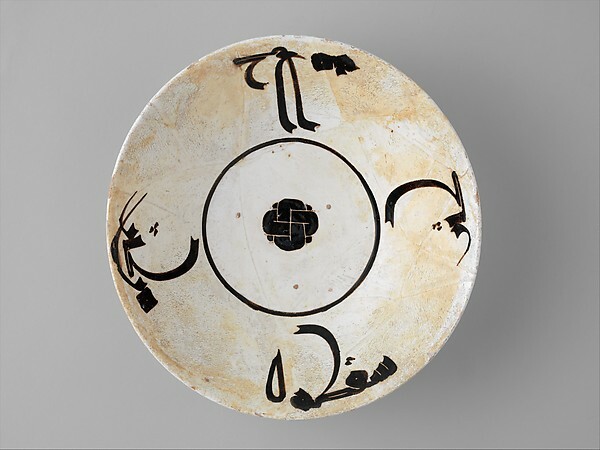 It would be interesting to define the script, comparing it with the inscriptions found on other bowls of the period. Also, it would be nice to understand whether the style of the script was affected by the text inscribed and its content, as I suppose. By now, I will simply use this inscription as it was meant to be, when it was produced in 10th-century Nishapur: as a moralising sentence. S. Blair, Islamic inscriptions, Edinburgh 1998.